The concluding chapter summarizes the findings and trends collected in the countries’ chapters. Seven cases of austerity policies in the local public sector (Greece, Portugal, Spain, Italy, Cyprus, Croatia and Albania) are presented. In consequence, this chapter aims at analysing the scrutinized countries by a set of analytic dimensions concerning policy transfer, the outcomes of austerity and their impact on Local Public Service management and delivery. Henceforth, a comparison among the seven Mediterranean austerities is provided looking for classification of different types of austerity. 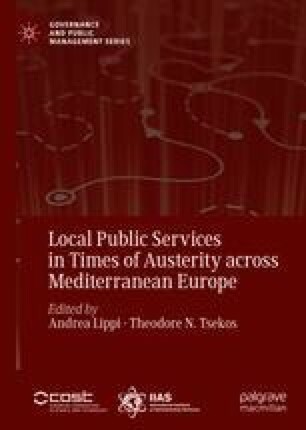 Finally, the chapter provides a discussion on the commonalities and variance resulting from a comparison and specific recommendation for policy-makers about the adoption of austerity measures and the future of Local Public Service (LPS) in Mediterranean Europe.